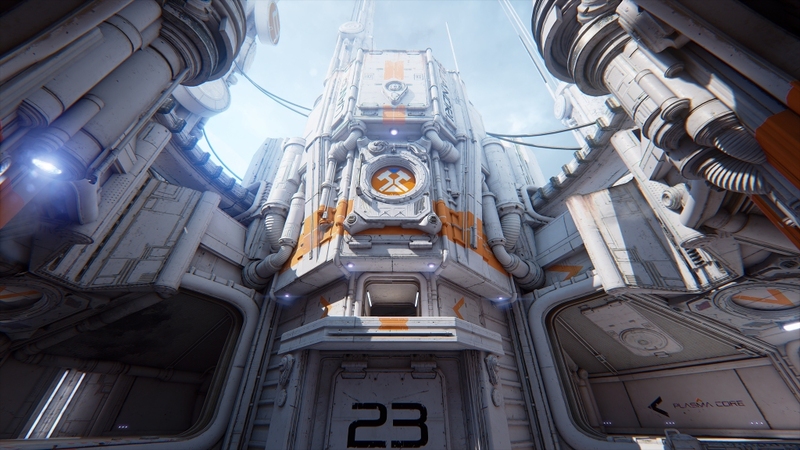 A new trailer has been released for the recently updated version of Unreal Tournament, which is being designed in part with the community and running on the latest version of the Unreal Engine 4. The trailer showcases an absolutely gorgeous new map called Outpost 23, and is accompanied by a few new additions to the marketplace. You can always tell when a developer does something spot-on because the YouTube comments are just full of praise, gushing and fanboyism. So what did I find in the comment section of the video above? Praise, gushing and fanboyism. I take it Epic Games is on the right track. To be completely honest that Outpost 23 map just had me floored. The sort of NASA-inspired space design and that glorious implementation of the latest in lighting tech brings the stage to life in ways that most people probably didn't think possible. A lot of it isn't just the geometry and texture work – both of which are amazing, by the way – but it's the way the lighting is used. For instance, there is a lot of granular shadow grades employed so it's not just a giant blob of one dark color. As an example, check out the image below from Outpost 23. A good example are the coils running into the pipes lining either side of the center column. If you look closely you'll see that it's actually dynamic, physical lighting in play. Gradient light sourcing casting different shades of shadow depth based on directional lighting. It gives the coil on the left side of the structure a multi-dimensional look since we have a small sun spot, and then a soft shadow where the light dissipates, and then a darker shadow being cast from the corner of the structure. All of these different light grades help give the Outpost a more realistic look. It's gorgeous. And we also get to see how the Unreal Engine 4 renders these amazing scenes with great speed and efficiency, as proven with the brief trailer above. The fact that a stage with this level of graphics fidelity can be rendered in real-time and run at 60fps is a serious, mouthwatering tease for graphics whores and Unreal Tournament fans the world around. This is also a great way to showcase the power of today's generation of software technology while also luring back in the fans of the series with a lot of familiar weaponry. We see the classic rocket launcher from the Unreal series return, along with the goop gun, the sniper rifle, the lightning cannon and one of my favorites, the chaingun. Another really neat thing about it is that the pace and gameplay is mostly mirrored after the original Unreal Tournament. We see a lot of that familiar gameplay that helped make the series popular in the first place, as opposed to the more slowed-down and Gears of War-esque pace that was introduced in Unreal Tournament III. My favorite part about it is that they decided to keep the hand models on the guns. One of the most annoying things in some of the earlier Unreal Tournament and Unreal Championship games is that there were missing hand models for the guns. It's just a pet peeve of mine. Anyway, Unreal Tournament is coming along very nicely and you can learn more by paying a visit to the official website. And don't forget that the Unreal Engine 4 is now free to use, so grab it if you haven't already.